¡Bong! The searing Syrian desert sun glinted off the Kalashnikovs. It was a tense situation – and about to get a lot tenser. I had planned to spend a chilled out August of mediation and blue-sky thinking in Aspen, but had been summoned on urgent and Top Secret business – on a mission so dangerous that even my inseparable assistant มาลัย (which means "Garland of Flowers" in Thai) had refused to accompany me. Once I decrypted the message, it was unambiguous. Now here I was with meeting the most ferocious faction of المعارضة السورية‎ the Syrian opposition. In our high-powered delegation were the true power-brokers of world diplomacy. Foreign Minister Sergey V Lavrov representing Russia. From the United States, Director of the CIA John Brennan and Professor Jeff Jarvis. And On Her Majesty's Secret and Jolly Important Service: the Rt Hon William Hague, Ambassador Ben Hammersley, and Yours Truly: the Bongster. "Worse than Infidels. Hypocrites!" spat the warlord. "I train the bravest martyrs - and you send them .... these." He kicked over a cardboard box of plastic toys. Similar boxes littered the barren desert landscape, as far as they eye could see. "The weapons you send us: no good." "But they're revolutionary 3D printed guns," Hammersley protested. Hammersley looked crushed. "As you must have read in The Economist. Or perhaps in my column in the BA In Flight Magazine, 'Business Life'", he tried to explain. "Everywhere I've taken Liberator and explained the revolutionary potential of 3D printing, particularly for the international IP rights regime, the audience has been impressed. Like at MumsNet, or the Inaugural Dorset Digital Corridor Launchpad ..."
The Ambassador was cut short by the warlord making a slashing gesture with his fingers across his throat. "No, you gibbering girl-ape", the warlord interrupted. "The only things these will liberate is your testicles from under your ridiculous skirt," he added, gesturing at Hammersley's ironic kilt. "As my bodyguards will now demonstrate." And with that, two burly men dragged the visionary social media futurist and Distinguished Scholar and Global Governance Fellow behind a rock. "I get it, I get it!" I said, hoping to dispel the chill that entered the blazing desert air. "You want freedom." "No, you idiot. We HATE freedom. Once the Baath'ists have died like dogs in the streets of Damascus – then, we can ban dancing." From behind the rock came a soft popping sound. "My people are dying by the thousand. They use toxic chemicals against us. We are now defenceless. Friendless. Our hope is all but extinguished," he paused. "So, Professor Jarvis, tell us about this Nextification Strategy of yours...."
A few minutes later – that seemed like hours – our [US rescue helicopter??] was banking sharply, the trail of rebel machine-gun fire receding beneath us. "I guess the Syrian rebels are not ready to embrace the new narratives made possible by Vine, and the dispersed power of hyperconnected storifiers," I consoled the Professor. "Or for iOS7," sighed Jarvis. Yes. It was the controversial Apple iOS makeover that had done it. I knew things were turning sour when the Warlord and his rebel leaders first glimpsed the colourful pastel shades and the beguiling parallax wallpaper effect of my iPhone 5b ('Bong Edition). But whose idea had it been to conclude the iMovie presentation with the Prophet Mohammed bestride a psychedelic My Little Pony, throwing Fail Whales at a cartoon President Assad? I suspect that concept had come from the playful hand of Hammersley. But now alas, that playful hand was something the Ambassador to Silicon Roundabout would not have to worry about any more – and it's not the only thing Hammersley left behind in the pitiless Syrian desert. As the chopper lifted our delegation nearer to safety, there was a tense, Kardashian-sized pregnant pause. "So who's going to tell Jony?" For some reason, all the Foreign Ministers were looking at me. "Ive. You know where to find him," the Cupertino security chief sighed as he nodded me through the barbed wire and over the booby-trapped ditches. "Yes. The world's quietest room," I replied, knowingly. This was the vast, fabled test building where no sound from the outside world could penetrate the walls – and no sound could escape. It had been built for testing Apple's iPhones, and it was so quiet that the sound of a fruit fly alighting on a tangerine 800 yards away sounded like 20 Elon Musk Space X shuttles all crash-landing to earth at once. Since Jobs' death, it had been commandeered as Ive's Mind Gym. I slipped into my speedos and entered the dark waters of Jony's flotation tank in the centre of the vast room. Inside a video was playing. Jony had it on a loop. It looked like this. "This is what matters," he repeated. "This is what matters." "I'm sorry, Jony, old chum," I handed him a scrap of paper, torn from London's Evening Standard newspaper. The article was titled "The Hottest 25 under-25s," and this is what I had circled. This is what the cutting said. The master designer fell silent. He nodded. "Paying bills online. How ... extraordinary. And he's just 19. Why didn't Apple think of that? Why. Why??" Now with a resigned look, Ive wrapped a towel around his torso and headed for the door. "Adios, Steve. Adios ... Cupertino". I was left alone in the dark waters of the tank. Turning to go, I noticed something round and fleshy and the size of a shrivelled grape rolling in the water. I hit Hammersley on speed dial. "Ambassador! Professor! Uh, Benjamin. Great news! Jonny won't be troubling us with any more visual makeovers. Tell Jordan the job's his. And that means dialogue with the Syrian rebels can now reopen," I told him. Steve Bong (official title: Lord Bong of #businessmodel) is the founder of Bong Ventures, an early stage investor and incubator focussing on innovative new technology start-ups based in Shoreditch, London. When he's not helping rear the next generation of business models, Steve enjoys parties, foreign travel, extreme cuisine, Open Data and draws his inspiration from Ayn Rand and His Holiness the 14th Dalai Lama. He advised (then hired) No.10 policy guru Rohan Silva on mindfulness and innovation, Mark Zuckerberg on the Perfect IPO, the Republic of Kazakhstan on emergent social media strategies, LOCOG on brand enforcement, and imagineered the Olympic Opening Ceremony with Danny Boyle, Shoreditch's #guardian coffee coffee shop with Jemima Kiss, and was the social media consultant for Edward Snowden and Lady Thatcher’s Funeral. At the personal invitation of Kim Jong Un, he is a strategic consultant on the Nextification of North Korea. Steve wants to pivot the BBC into the 22nd Century, blue-skying its hugely successful Digital Media Initiative, and advises the UK Government on icon design and the new National Curriculum. He favours Small Government but Large Catapults, and wants more taxpayers engaging in Ambient Crowdsourcing. 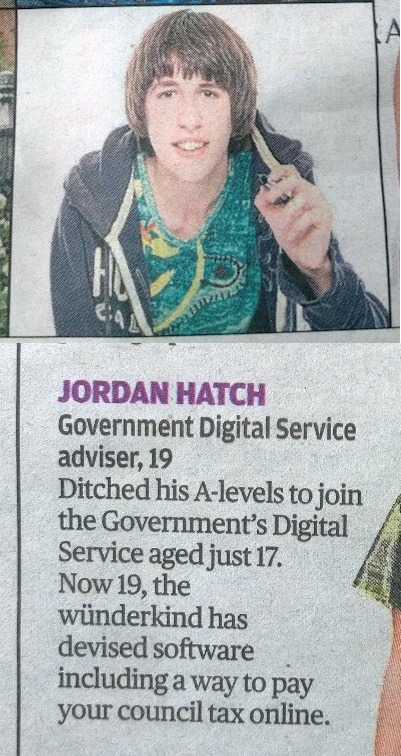 Can Jordan revolutionise the UK Government while he saves Apple? Join Steve's KNOWLEDGE TRANSFER NETWORK and FIND OUT@BongVentures on Twitter.